Another solid day over at Fan Duel, I hope you have followed along and been making some $$$. 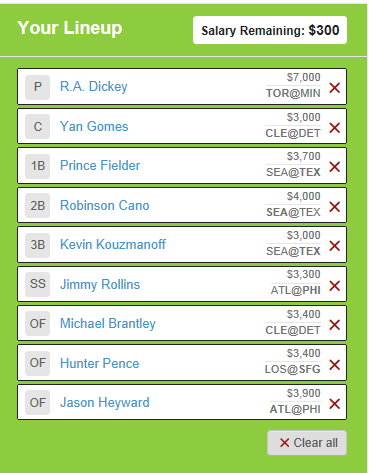 This is a lineup I like for just the early matches, check back later today for a late game matchup lineup. R.A. Dickey vs. Minnesota Twins – Dickey has a good history on the road over the past 3 seasons. For the value this is my favorite matchup of the early slate. Robinson Cano vs. Tanner Scheppers – Scheppers is struggling against lefties this year and that’s why I love Cano today.